Exactly 134 years after the first Orient Express trip between Paris and Constantinople in October 1883, SNCF Group, owner of the luxury train brand, and AccorHotels have teamed up to continue its development within the luxury hospitality sector. The first Boeing B787-10 Dreamliner built for Singapore Airlines was rolled out by the manufacturer last week at its final assembly facility in South Carolina in preparation for painting in the airline’s livery and the start of system checks, fuelling and engine runs. More seats on routes to the US from next year, with larger aircraft and Virgin Atlantic taking over one of Delta Air Lines’ Heathrow – New York frequencies, are features of the two carriers’ updated summer 2018 schedules to optimise their joint network. Four new partner airlines have signed up to the “Worldwide by easyJet”. The distribution service was announced by the carrier last month for passengers to connect from easyJet flights to other airlines’ long-haul services. For the first time the easyJet website will also play host to another carrier. 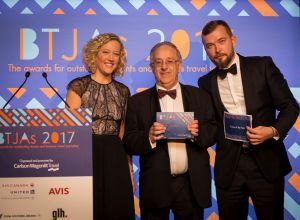 The winners of the 14th annual Business Travel Journalism Awards were announced during a spectacular awards dinner at The Natural History Museum last week with BTN taking “Scoop of the year” for COMMENT 26 September 2016 “Female only security lanes”. The end of Monarch Airlines is a blow for our industry but it could have been worse. The CAA has been shown to be capable of some fancy footwork when needed. Now comes the hangover as rumours mount about how Monarch was run and what effect the collapse will have on other low-cost carriers and the future of cheap flights. Having won Scoop of the Year at last week's BTJAS awards evening (see in this week's issue) Business Travel News is in line to win it again in just under 12 month’s time. Editor in chief Malcolm Ginsberg is one of a handful of travel writers and airline experts worldwide to be invited on the maiden scheduled flight from Johannesburg to St Helena (HLE) next Saturday 14 October. BTN expects to bring a full report next Monday. A new North American gateway at Philadelphia with services four times a week from and to the Dublin hub is being launched by Aer Lingus as part of its 2018 summer schedule. As Singapore Airlines’ first Dash-10 Dreamliner rolls out in the US (see this issue), British Airways has celebrated a milestone aircraft delivery of its own as it welcomed its 25th Dreamliner to the fleet. Scotland’s plan to lead the way to an eventual abolition of the UK-wide Air Passenger Duty (APD) by bringing in a lower-rate Air Departure Tax (ADT) of its own was in jeopardy last week over a wrangle about the Highlands and Islands airports. A new six-times-weekly route between Dublin and Reykjavik starting next May and a new pricing structure giving passengers more fare options when booking were unveiled last week by Icelandair. Travellers between Inverness and Heathrow are being given a boost after British Airways said it would expand its service on the route from seven to ten flights a week from next March. Aberdeen International Airport’s new extension building has been officially opened by the Duchess of Cornwall (Duchess of Rothesay, as she is known in Scotland), arriving to the sound of airport employee Karen Bain playing Scotland the Brave on the bagpipes. Jurassic Park star Sam Neill’s latest role as the voice of Air New Zealand mascot Pete the Kiwi premiered in the UK last week as the airline brought its new “Better Way to Fly” global campaign to Britain. In order to spread the gospel of the motor industry, the SMMT (Society of Motor Manufacturers and Traders) holds three annual events where most manufacturers offer a good selection of their products to journalists to drive and hopefully write about. BTN editor-in-chief Malcolm Ginsberg took a day out. The pre-eminent event is Millbrook Proving Ground, Bedfordshire in May, with its high-speed bowl, hill route and off-road course. These are supplemented by regional test days, road driving only, in September at Basingstoke and York. The problem with these days is that they are only a taster and jumping from one motor to another can be muddling. I had a problem finding the start button on a particular vehicle until finally the manufacturer’s representatives were called over to assist. Does someone know something we don’t know? Surfing the internet as we at BTN occasionally have time to do, we came across the realistic-looking little gem below. Preview tours inside Brooklands Museum’s new Flight Shed and Aircraft Factory, which have taken years of planning and fundraising, will be a major attraction at the attraction’s annual Aviation Day next Sunday. The dispute between manufacturers Boeing and Bombardier over alleged subsidies (BTN last week) intensified on Thursday after the Canadian company condemned US plans to impose import duty on its aircraft. The drink-drive breathalyser yesterday marked 50 years since its introduction. Police carried out the first roadside test on a motorist on 8 October 1967 as the criteria for prosecution moved on from touching your nose with your eyes shut, walking in a straight line or standing on one leg. An order valued at nearly US$1bn at list price for the advanced LEAP-1A engine has been announced by the Cathay Pacific Group and CFM International to power Cathay’s 32 new Airbus A321neo aircraft. Delivery is scheduled from 2020. With statistics showing electric car sales rising by 172% every five years, hotel management company Hospitality First has installed charging points at a selection of its most popular properties, with the rest to follow shortly. Two new property acquisitions have been announced by the Meliá Hotels International group in Venice and Rome as the company continues its expansion in Italy. Four more Boeing B777-300ERs are to join the Qatar Airways fleet as part of an order just announced by the companies. After an absence of more than nine years, VLM Airlines is to fly again on the route between Antwerp and London City Airport from 30 October. It follows the announcement this month from Cityjet that it will stop operating the route from 27 October.